Looking to kit your garden out with the best garden furniture? There’s nothing more relaxing than gently swinging back and forth on a hanging chair. With summer around the corner and the warm weather already setting in, now is the time to invest in a hanging seat for your garden, so we’ve come up with a list of the best hanging chairs for spacious back gardens to small courtyards. When you've chosen the best hanging chair, head to our sourcebook of top garden suppliers for more garden-related shopping. What is the best hanging chair? A hanging chair is all about combining style, durability and comfort and we think the John Lewis Cabana Hanging Pod Garden Chair has got it just right. With a plush cushion marshmallowed into a compact, stylish pod frame, this is for those looking to sink right in. Most hanging chairs these days come with a stand, so you no longer need to risk hanging your seat from a rather precarious looking tree branch. But if you do happen to have a suitable tree in your garden, take a look at the Amazonas Belize Hanging Chair for a cool, bohemian style hanging chair that can stay out all year round. A contradiction of cushiony plushness and hard steel, this chair makes the perfect hanging seat. Thanks to its pod design, this is a compact chair that’ll look in proportion, yet it’s still sizeable enough to park yourself for an afternoon of relaxing and unwinding. With a wicker effect frame, this chair very much remains 21st century and it comes in both black and natural colours so you can ensure it’s the perfect fit for your garden. For a hanging chair that looks edgy and that bit different, this one from Copa Garden should be at the top of your list. Its funky jungular colour scheme combined with wacky linear patterning makes it sharp and modern, perfect for smaller gardens that need a feature piece to brighten it up. Best of all, there’s a matching dining set so you can keep everything in sync. If you love your wooden garden furniture, take a look at this hanging seat from Amazonas. If you’re one for drifting off in your own bubble, this orb-like seat will certainly whisk you away to a far off dream land with its plush cushioning and steady swinging. The chair is supplied separately to the stand, so if you already have a place in mind, perhaps a suitable tree, you don’t waste money on the stand. Soft in appearance but made from hard materials underneath, this beautiful hanging chair will sit harmoniously in your garden all year round. 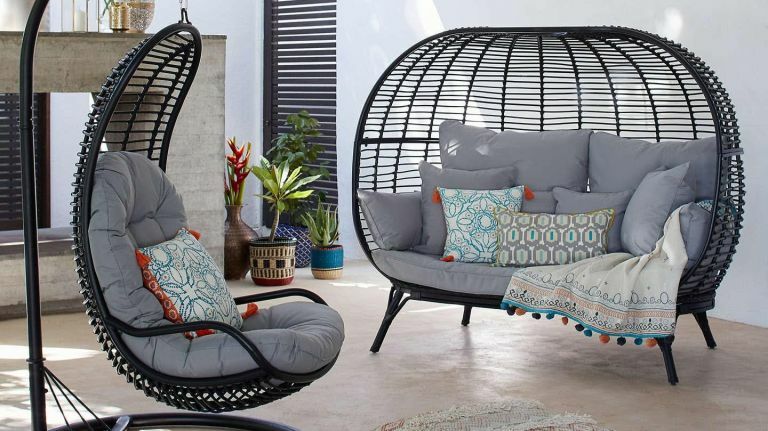 With its woven wicker effect, it’s traditional in its appearance, while its pod-like design is large enough for one and shouldn’t take up too much space in your garden. It comes in a natural or grey colour scheme with a corresponding super spongy cushion. With a sleek rattan finish, this contemporary swing chair will make the perfect addition to any garden, manicured or no. The synthetic rattan chair comeswith black iron stand, big egg swing, white cushion seat, headrest and cushion cover, and the waterproof cover makes storing it in winter easy. The super squidgy cushions are just waiting to be fallen asleep on. With its close, nest like weave, this chair is all about cocooning up with a good book. Made from PU rattan instead of the real material, this chair is suitable for keeping outside all year round. It comes with a marshmallow-like cushion that you can take out when the weather is wet, although it is showerproof so don’t worry if there’s some expected rain. You can also purchase this chair in brown and light brown. So long as you have somewhere suitable to hang this chair, this one is a great option. In addition to being the most cost-effective number on our list, its cool styling and comfort factor make it the perfect place to relax with a book and a beverage. It’s UV and fade resistant, so you don’t need to worry about keeping it out in the sun and it’s weatherproof so you don’t need to rush to bring it in when it rains.